Born: 6 April 1840, Meanwoodside, near Leeds, United Kingdom. Died: 5 February 1875, near Francistown, Botswana. Frank (or Francis) Oates was the son of Edward Oates, a wealthy merchant of Leeds, England. From an early age he shared his father's interest in natural history, particularly in the birds of England. In 1860 he entered the University of Oxford, but terminated his studies in 1864 without obtaining a degree, owing to a resipiratory disease. After recovering his health while, residing mainly in Wales and the English Lake District for a few years, he spent a year in Guatamala and California during 1871-1872, where he collected birds and insects. Upon his return to England he started planning an expedition to the Victoria Falls. In April 1873 Oates and his younger brother, William Edward, arrived in Durban and prepared for their journey in Pietermaritzburg. Accompanied by some friends they travelled via Pretoria and Shoshong (near present Mahalapye, Botswana) to Tati (near present Francistown, Botswana), where gold was then mined on a small scale. They arrived there on 26 August and after a short hunting trip all except Frank Oates returned to Natal. He remained, planning to visit the Victoria Falls, collect natural history specimens, and explore north of the Zambezi. He first travelled north-eastwards to Gubuluwayo (now Bulawayo, Zimbabwe), headquarters of the Matabele chief Lobengula, where he was well received and obtained permission to travel and hunt in Matabeleland. During October and November he hunted and collected around the Umgwanya (or Ingwenia) River north-east of Bulawayo. He then returned to Shoshong to prepare for his journey to the Victoria Falls, setting out in May 1874. Several days travel north-west of Tati along the well-used waggon trail he was prevented from continuing his journey by hostile local people and returned to Lobengula's headquarters. After further delays, and against the advice of Frederick Selous* to wait until after the rainy season, he finally reached the falls on 31 December 1874. A few days later he set out on the return journey to Tati but began suffering from malaria. At Mpandamatenga (on the Botswana-Zimbabwe border) he was met by the trader George C. Westbeech and Dr Benjamin F. Bradshaw*, who accompanied him. However, he died several days before they could reach Tati. Dr Bradshaw arranged for Oates's collections and other possessions to be returned to Shoshong. Though some of the insects were lost, the rest of the collections were sent on to England. His letters and journals were edited by his brother, C.G. Oates, and published as a book, Matabeleland and the Victoria Falls: a naturalist's wanderings in the interior of South Africa (London, 1881). Catalogues and descriptions of his collections were compiled from his letters and journals by various experts and included in the book in the form of appendices. Oates's illustrations of animals and scenery are of fairly good quality, and he compiled reasonably accurate maps of his travels. The instruments he used on his travels included a thermometer, a sextant, and an aneroid barometer to measure heights above sea level. He was a careful student of nature, collecting mainly insects, birds (including their nests and eggs), and plants, but also some reptiles, skins, horns, and four Bushman skulls. The latter were described by Dr George Rolleston (Appendix 1). With regard to insects he concentrated on the Lepidoptera (butterflies and moths) and Coleoptera (beetles), and is credited with 19 new species. These included some Acraea butterflies, described by Professor J.O. Westwood (Appendix 4), which are common around Victoria Falls. The birds were identified by Captain G.E. Shelley* and 213 species listed, with Oates's notes, by R.B. Sharpe (Appendix 2). The wood shrike Bradyornis oatesii (since renamed) was named after him, while Oates's bird snake, the sub-species Thelotornis kirtlandii oatesi, still caries his name. Two snakes were described by A. Gunther (Appendix 3). His small collection of plants was listed by D. Oliver (Appendix 5). The species Anthericum oatesii, Adiantum oatesii, Erica oatesii, Combretum oatesii, and Hebenstreitia oatesii were named after him. His plant specimens are in the herbarium at Kew Gardens. Oates did not marry. He was elected a Fellow of the Royal Geographical Society in 1872. He was an uncle to Captain Lawrence E.G. Oates, who accompanied Captain Scott on his disastrous expedition to the South Pole in 1910. Oates, Frank. Matabeleland and the Victoria Falls: a naturalist's wanderings in the interior of South Africa (edited by C.G. Oates). London: C.K. Paul, 1881. Pinhey, E.C.G. Rhodesian lepidopterists. 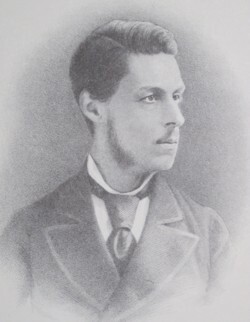 Frank Oates (1840-1875). Zimbabwe Rhodesia Science News, 1979, Vol. 13(5/6), p. 141. Tabler, E.C. Pioneers of Rhodesia. Cape Town: Struik, 1966.